Earlier this morning, as I was spending my short quiet time reading an article my husband sent me which was explaining in depth a subject in the bible I had earlier in the week asked him about, I had a thought. The thought was this: why does this read so choppy to me? Why am I still wanting more breath and depth then this extremely articulate article is providing me? What am I still missing? Something feels missing. This was after at least three interruptions from my son who tiptoed into my room and asked, “Mommy, can I snuggle you?” To which I replied, “in a little bit, when mommy is done reading her bible.” Then off he went to play trains in his room. So when I finished off my attempt at quiet time by reading a psalm and the last chapter of 1 John, I prayed and asked the Lord about why that article felt like it was missing something deeper. And here is unfortunately what he said. I say unfortunately because it paints me, in my mind as somewhat of a dolt, which I am for obvious reasons, not fond of. At first I see crumbs, they are banana bread crumbs, on the ground, under my kitchen table. Now, I have a small toddler living in my home who OFTEN finds in-between meal snacks from the ground, and being that she and the twins are not the cleanest of eaters just yet, it’s not hard for her to do so, so this is a very relatable word picture to me. 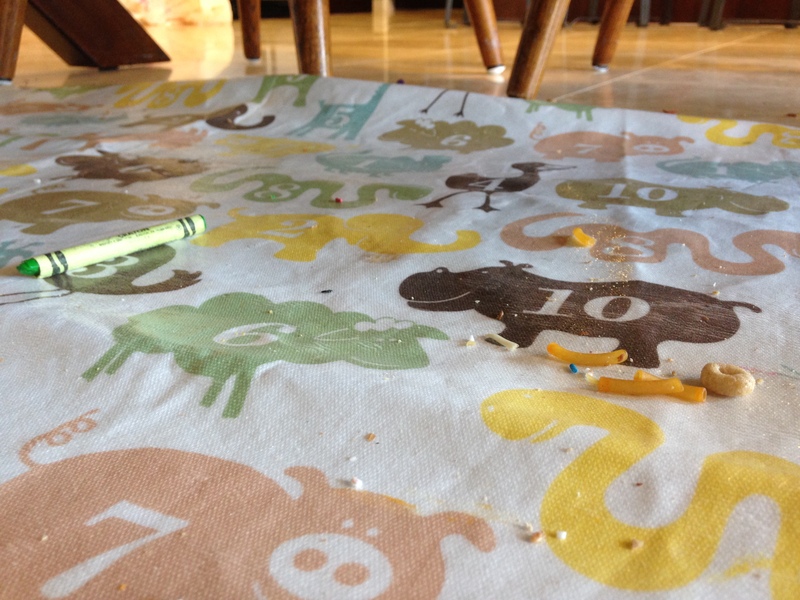 So there are crumbs under the table, and in this word picture, when I find a yummy banana bread crumb I eat it and think to myself, “Mmmmm, that’s so good”. So then I search for another one, and find it and eat it. Sometimes they are small, sometimes they are a bigger type of crumb, but always they are crumbs. Then, I see lots of people eating at a table, but I am still under it, so it’s just lots of legs and feet, and crumbs falling here and there. Every time a crumb falls, I am super quick to grab it and eat it. In a way, scamper about on all fours, waiting for crumbs to fall and gobbling them up. He showed me that I am accustomed to filing myself up with other peoples crumbs. I have become very good at it. So, I’m not hungry, but I have to dart from here to there to get enough to eat, scampering about on all fours (Glollum style). I am definitely not sitting, nor at rest enjoying a meal or snack at the table as was intended. And do you know what the crumbs are? God’s truth, his word, from other people. Here is what I tend to do in real life: I hop from this author to the next, to this blog to the next, from that sermon to this bible study, to that encouraging word posted on fb. Then onto the inspiration video and back into a book on how God loves us. I jump. I jump from here to there to everywhere to hear all about God, his truth, his word and having someone else illuminate scripture FOR ME. I’m eating their God inspired crumbs and they are delicious, but they are only a crumb of what I could have. Why? Because it’s easier to read an inspirational blog full of truth in five minuets while I stand in the hallway waiting for the laundry to be done washing, while intermittently making sure the kids aren’t getting into something they shouldn’t, breaking something, or breaking each other. I know it takes time to read God’s word and have it illuminated. Because until this word picture, I thought I’d done it a few times. And perhaps I have, but that’s not my habit that is for sure. My habit is to be filled up on Saturday by the worship and message, then read this book on Sunday, that blog on a Tuesday when I’m feeling down about motherhood or busyness or whatever and top it off with a chapter on Friday about holiness. All in between are brief moments in scripture where I actually read the bible myself and then move right along onto the next thing. Not often taking time to ponder, to pray to seek God and actually ASK for insight regarding what I’ve read. And like I said, all those things are good, but they don’t make a meal. None of those things are bad in themselves, but collectively, if they begin to override my quiet time with God, if I am so accustomed to quickly hearing God’s truth from a scripture that someone else has shared, then I am indeed in a not-so-good place. Perhaps I am wearing myself out hopping from one thing to the next, seeking deep and meaningful truth (AND a RELATIONSHIP WITH GOD) from other peoples relationship from God, in five minute segments. Which is why I say it does not paint me in the brightest of lights. I don’t stand up and sit at the table because that is work. Apparently I think it’s easier to stay on the ground and spot crumbs. I’m quick, it’s fast and and I’m good at it. But here’s the thing. If I’d just stand up on my big girl legs and go to the table, and then SIT STILL, I might get a whole piece to myself, to enjoy slowly over time and really appreciate it for what it is, and in turn, get to enjoy being at the table like one of God’s kids. But I’m rarely sitting still physically, and now I’ve grown accustomed to not sitting still spiritually. In my energetic quest to move onto the next insight, I’ve lost the real idea, which is to sit and ponder and seek God, on my own, one-on-one with him. Not to find the next book, or the next blog to fill me up. I get that these are all excuses, but somehow I’ve allowed how most of my day is: full of interruptions, bursts of activity, making meals, breaking up fights and teaching kindness, selflessness and love all filtered through tired eyes just wanting a moment of quiet and peace. All of that I’ve allowed to change how I interact with God. I’m interacting with him the same way I interact with myself, always searching for a crumb of quiet time to myself, or a crumb of sitting down, or a crumb of writing or even a crumb of a hot meal eaten all in one sitting. That may sound like complaining and it totally is. The fact is, my life is different. Often times my son comes sneaking into my room WELL before my natural clock wants to be awake and well before my brain is awake enough to have a thought or moment with God. Sitting down with my bible and a pen in the late morning over coffee is a distant fond memory from the past. And although I say I don’t have time, maybe if I even tried just turning to the bible in all those little moments, instead of turning to insightful blogs, books or sermons, I might learn to tune into God even in the hectic. God’s not surprised that I do one-thousand little things all day, never sitting down. He’s not surprised that I don’t wake up and have leisurely coffee with him in the morning, because we both full well know that means him waking me up at 4 in the morning, something I only do when it happens to happen. I never intentionally wake at 4 am. However, that doesn’t mean that I need to get my fill through other peoples crumbs about him. Sometimes I’m tempted to think about how nice it will be when the kids are off and away at college, and I’ll get to wake up on my own when the sun rises and drink coffee and read my bible in peace and quiet. I start to think about how nice it will be to have time to iron something and then wear it, without worrying someone will snot on it and then all my time (which is currently so precious) was wasted on one hour of ironed shirt wearing glory only to be taken out by 9am and switched for a sweatshirt. But then I remember, THIS is where God has called me. Right here in the middle of twenty-two thousand interruptions, in the middle of wearing leggings and long sweaters everyday because they are black and wash easy. In the middle of half-eaten meals interrupted by “I’m done or more please!” In the middle of being so exhausted by 8:30pm that I gladly crawl into my bed if only to forget about the long day and relish the sweet parts as I drift off to sleep. What I’m saying is that if I have the energy to scamper and jump to each crumb, then I can muster the self discipline to SIT STILL before him and trust that he will bring me a big warm slice of banana bread if I just sit at the table and wait. Other peoples crumbs are nice, delicious even, but they always leave me pining for the real thing. A whole piece to myself, enjoyed at the table like one of his kids. So, although there are many good things to be read out there, and I’ve already downloaded 12 free Beth Moore books on my Kindle, I’m going to take a bit of a break, and start to let some of what I’ve read in the bible, during my own “quiet time” begin to sink in. And in all those little moments when I’m searching for a crumb throughout my day, I’m instead going to let my mind rest, and think about what God is already teaching me, in his word. As always so full of wisdom. Thanks for sharing. Enjoy!